Rotating clothes seasonally? This is something many of us already do anyway. After all, heavy winter shirts don’t fly in the summer, and I’d freeze to death in some of my thinner warm weather shirts if I wore them in the heart of winter. If you’re doing this already, congratulations. This is a very good money saving tactic because it manages to make it appear as though you have a completely fresh wardrobe a few times a year without ever buying anything new, plus it spreads out the wear and tear on your clothes so that you can use things like end-of-season sales to refresh your wardrobe instead of having to pay full price for clothes. If you’re not, this is a bandwagon well worth getting on. Here’s how I rotate clothes seasonally and how it saves me money. 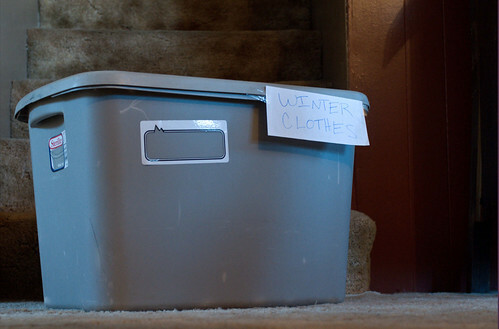 For starters, I have a large clothes tub that’s labeled “Out of Season.” Each member of my family has one of these tubs, too. Whenever the weather gets warm enough on a consistent basis (or cool enough) that I’m not interested in wearing most of the items in my closet or drawers, I pull out that box and swap the contents of it for everything currently in my drawers. This usually happens in late March/early April and again in late September/early October here in Iowa. I do usually save three or so outfits of out-of-season clothing just so I have something appropriate to wear on unseasonably warm and cool days. I then leave that box out for about a month, for two reasons. One, I usually need to catch up on a bit of laundry, so I’ll keep adding freshly-washed items to it. This is because I want everything that comes out of that box to be clean and wearable. The second reason is a bit more clever. If I happen to see one of those handy “end of season” sales where out-of-season clothes are heavily discounted and I know that my clothes count is relatively low, that’s when I’ll buy a few items. Those items go directly into the “out of season” box. When I’m satisfied that the box is ready for storage, I close it up and store it for five months or so, usually in the garage rafters. For me, at least, I found this particularly powerful when I was transitioning toward buying fewer new clothes. I found that the simple rotation of the wardrobe would often provide me with a lot of “new” clothes (both in the sense that they were actually new items from end-of-season sales and that they were clothes I hadn’t seen in half a year so that they seemed new). This was incredibly effective at cutting down my desire to buy new clothes because I already had the sense that I had piles of “new” clothes, thus keeping money in my pocket. Many people already use this tactic, but if you’re not on board yet with a good wardrobe rotation, give it a shot. It makes you feel like you have a fresh new wardrobe every six months without the expense of actually buying a lot of clothes.